Neal Harris of Relax4life offers consulting services in several ways. Having designed and created a number of public and private outdoor labyrinths, he can help individuals and groups create a walking labyrinth on their premises from start to finish. 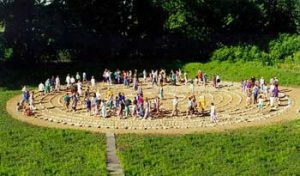 For those interested in creating a walking labyrinth as a group project, we have labyrinth-making manuals that give step-by-step instructions for laying out 3 popular labyrinth designs. These manuals make the creation process a simple one. For a group that needs more assistance with their project, we can lead a group on installation day in the step-by-step process of laying out the design of their choice. This has the advantage of giving the folks who take part in the creation process a sense of community, pride in their accomplishment and a vested interest in the upkeep/maintenance of the labyrinth. The overall price of a labyrinth project depends upon the size, design and choice of materials. 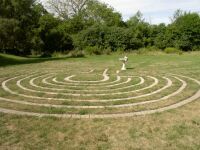 Call or email him to set up an on-site or phone consultation to discuss your group’s ideas for a labyrinth installation. He looks forward to being of service.